Functional meets futuristic in the contemporary design of this LED bathtub faucet. Triple handle waterfall faucet is made from a solid brass body with chrome finishing. Handheld shower included. Never wonder what temperature water your bathtub is being filled with. The visual cues emitted by the water temperature eliminate all guesswork. There is a small dynamo inside the faucet. When you turn on the faucet visual temperature cues alert you to water temperature. 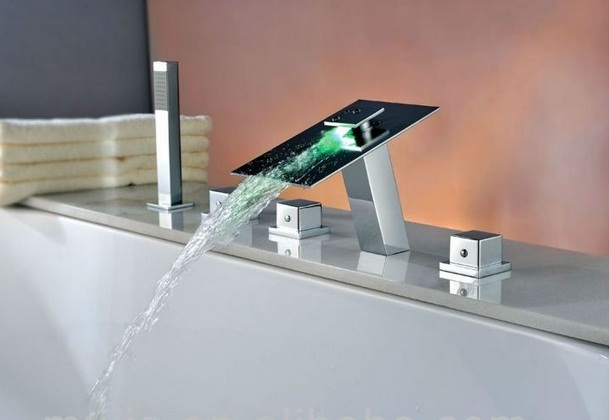 I liked the LED feature of this faucet when I saw it in the picture. It looked bright enough there, even if the background was pretty bright. So I was kind of disappointed when I tried this at home. The LED light wasn't as bright as I expected them to be, and they're actually kind of hard to see in daylight. Still, I'm just glad that they work, but I must admit that I am not very impressed. This is probably the most expensive bathtub faucet that I bought (I already the bathtub faucets replaced twice over the years) but I'm of the idea that every penny was worth it. The design looked really great, and it looked really modern and contemporary. The LED lights though were the real deal. They looked brilliant when turned on, but I wish they could've been a bit more brighter. I bought this faucet for the tub because I though it would look good in it, and that wifey and the kids would love it. After having it installed, I was impressed by how it looks and true enough everybody at home loved it. Great thing that the kids are grown up now, because I was worried that they may hurt themselves on the squared edges of this faucet, but I see that they've been finely polished and I don't have to worry about a thing. I was looking at bathtub faucets and saw the LED lights on this one. Not that I wanted LED lights on my faucets though, but hey, since I was remodeling why not try something new, eh? I also noticed that this faucet came with a handheld shower, which is a great addition I think, since our handheld is attached to the shower and not the tub, so yeah, I thought it would be nice to have one on the tub as well. 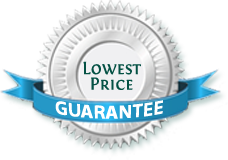 Overall a great product, no complaint whatsoever.